These DISK BOOKS are made from reused floppy disks. They are little notebooks which are a handy size to carry in your handbag. The paper is 100% post-consumer recycled. Go to lillipilli's etsy shop to snap one up. Also available at 'The Little Market at Avid' which is held on the last Friday of each month. It's held out the back of 'Avid Reader' bookshop and cafe, 193 Boundary Street, West End Brisbane, Australia. 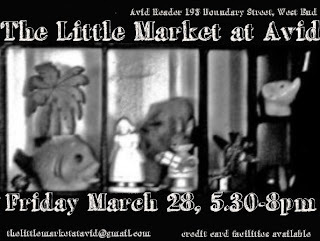 The next market is March 28, 5.30pm - 8pm.